Breakfast for children is, in fact, a very important meal to get the day started off right. Why? 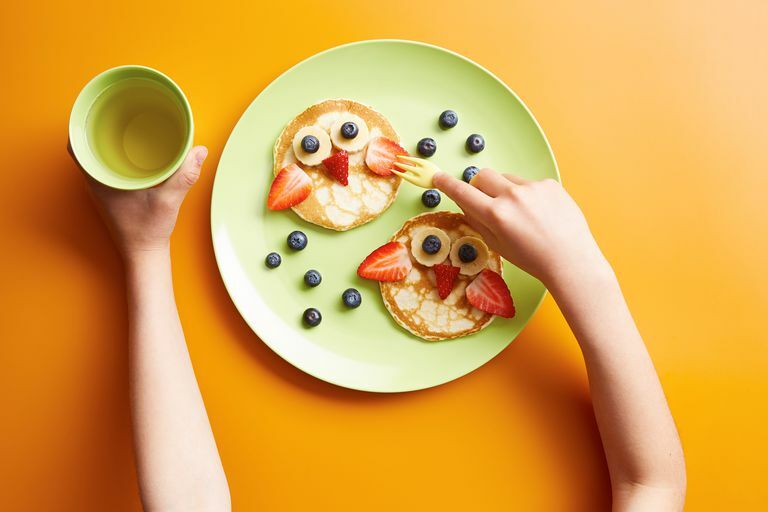 After sleeping and growing during the night, kids need to refuel their bodies for the day ahead. Breakfast provides energy for the morning and eating breakfast can lead to increased classroom concentration. Can you imagine trying to participate in a science experiment or concentrate on solving a number bond with your tummy grumbling? It’s tough, especially for kids who aren’t allowed a snack at school. Breakfast is their only chance of eating prior to lunch. Sometimes, finding the time to eat and/or make breakfast is the challenge. With the school morning breakfast suggestions below and some planning, you’ll find ways to conquer those challenges and pave the way for a productive, learning-filled day. An added bonus is that, depending on the age(s) of your child(ren), they can get many of these food items prepared on their own or with minimal help on school mornings. Smoothie packets: Freeze the fruits and vegetables that you need for your favorite smoothie in individual portions so that all you have to do in the morning is add the liquids/add-ins and blend. Pancakes and waffles: Make a large batch of whole grain pancakes or waffles over the weekend and freeze in a freezer bag with a sheet of freezer paper between each. Defrost in the toaster or microwave and top with walnuts and fruit, nut butter, and banana slices, or your family’s favorite toppings. Breakfast egg cups in a muffin tin: You make these ahead of time and freeze them, and since it yields six egg cups (or more, depending on how large your muffin tin is), that’s six breakfasts that you can have stored and ready in the freezer. Muffins: Make your favorite whole grain muffins and freeze them to easily defrost for a delicious homemade breakfast. Whole grain English muffins: We like to keep whole grain English muffins frozen to use as a quick breakfast food. They can be used with a microwave scrambled egg and grated cheese to make a breakfast sandwich, or use it as you would use toast, waffles or pancakes. Egg and English muffin sandwiches: Make these sandwiches ahead of time with a low-fat meat option and freeze for a fast microwavable breakfast. Overnight oatmeal: Make breakfast while you sleep! Overnight oatmeal is delicious, filling, nutritious, and so quick to make. Make it the night before in individual servings and you’ll have a breakfast that requires no preparation in the morning. Yogurt and fruit parfait: Make a few yogurt and fruit parfaits the night before and add granola to the top in the morning if desired. Hard-cooked egg: You can hard-cook eggs on Sunday for several uses during the week, such as a fast breakfast or for use in green salads or tuna or chicken salad. Cheesestick: If we are truly rushing, grabbing a cheese stick (with or without pizza dipping sauce, which is a favorite in our home), along with a box of raisins or a banana fulfills our breakfast dash needs. Microwave scrambled egg: Beat two eggs, two tablespoons of milk, and salt and pepper to taste in a microwave safe 12-ounce mug or bowl. Microwave on high for 45 seconds, stir, and then microwave 30-45 seconds more or until the eggs are cooked. One of our favorite ways to serve this egg is wrapped in a whole wheat tortilla with shredded cheese and salsa. It’s so quick and oh so good! Oatmeal: this breakfast makes our list again. When you wake up, turn the oven to 350 degrees Fahrenheit. Mix one cup of old fashioned oats, three cups of water, and a pinch of salt in an oven safe bowl. Bake for about 30 minutes (while you get ready for the day, wake the kids, pack up lunches, etc.) or until the desired consistency is reached. Stir in about a teaspoon of butter when you take it out of the oven, and then comes the most exciting part—toppings. Let the kids add their favorite toppings such as raisins, blueberries, walnuts, pecans, or whatever they'd like. This serves three kiddos a hearty serving of oatmeal. And if you don’t feel that you have the time to do this on a school morning, cook it on Sunday, refrigerate, and reheat for breakfast on Monday. If you don’t feel like dealing with the oven on a school morning, try crockpot oatmeal. And remember, leftover oatmeal can be refrigerated and enjoyed on another morning. Nuts, raisins, dried fruit, and whole grain cereal: Make individual portions of any combination of these to grab and eat anywhere. Check out this homemade trail mix that can easily be made, pre-packaged into individual servings, and grabbed for the hike to school. Toast with nut butter: It’s quick and easy. Whole grain cereal: If you are having a cereal and fruit morning, set out the boxes of cereal, spoons, bowls, and bananas or other fruit (or have it prewashed, cut, and ready in the refrigerator) the night before. You can get several of the above options ready over the weekend so that you have quick breakfasts available for the school week. Feel free to get the kids involved in the preparation of your breakfast options. Also, pairing your breakfast with fresh fruit is always a great option. There is definitely a way to get breakfast to the table (or to the car, or to the bus stop). A small investment in breakfast planning time will reap big rewards by making happy bellies and ready to learn minds.